When no other bank wants you, these 9 credit card superheroes will help lift you -- and maybe even your credit score -- out of the dumps. 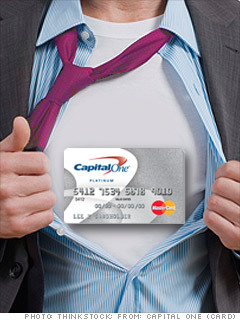 With a low annual fee of $29, Capital One's Secured MasterCard is a great way to get back on the road to good credit. While most secured cards give you a spending limit equal to the amount you deposit, this card is essentially a hybrid between a secured card and a regular credit card, making it one of the best picks for a customer looking to get back into the traditional credit card world, said Ben Woolsey, director of marketing and research at CreditCards.com. You can put in as little as $49 and still get a credit line of $200 with this card. If you deposit more money -- like $99 or $200 -- you can increase your credit line up to $3,000. Another big perk, said Woolsey, is that once you have established a positive credit history and improved your credit score, you're able to qualify and apply for one of the issuer's many unsecured cards. There is one drawback, however: The card comes with a 22.9% APR, which is high for a secured card.